'Narmer or Menes.' (1) is considered the first pharaoh of the Ancient Egypt who founded the first dynasty around the year 3150 BC. He come from Tinis and King of Upper Egypt and conquered the lands of the Delta Nile and it is assumed that founded Memphis establishing his capital there and he built there the Ptah Temple. 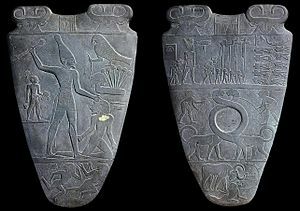 In the Narmer Palette which is preserved in the Egyptian Museum it was written this victory. 'Dyer' '(3) Horus who helps. He made conquests in the Sinai and in Canaan. 'Semerkhet' (7) The attentive friend. 'Kaa' (8) His arm is raised. The last pharaoh of the First Dynasty. His mortuary temple is in Saqqara and his tomb in Abydos. 'Hotepsekhemwy' (9) The two powers are at peace. This page was last modified on 4 October 2015, at 00:39.